A WELL-BEHAVED DOGMendocino is a pet friendly place to bring your pampered pooch! Although, not all businesses are able to accommodate your dog. Some boutiques have resident cats that may (or may not) have patience for dogs - and some folks are allergic. It's best to keep them on a leash and enjoy the places that love your pets too! Visiting Parks with your Dog. 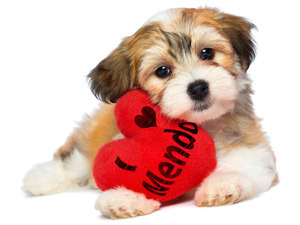 We have a great selection of Mendocino Hotels that welcome you and you're pet. Although not every room is suitable for pets, so please let your innkeeper know that you want the "Pampered Pet" room! Hands on Care with Total Supervision in a Protected & Safe Environment that is Fully Enclosed by Fencing. Dogs OK on a leash. Join their dog and knowledgeable docents for a leisurely stroll through the meadows and along the windswept bluffs of the 300 acre Point Cabrillo Preserve. You'll learn a little coastal ecology and some Mendocino history including the story of the Frolic, the 1850 shipwreck that changed the north coast forever. Well behaved parents and their pampered pets are welcome to enjoy the most picturesque dog walk, you're likely to come across. Located on 47 Ocean Front acres, this magnificent landscape includes canyons, wetlands, coastal bluffs, a closed-cone pine forest and a varied array of floral and plant collections. Dogs Must be on Leash. Where the Pacific ocean meets the Big River to form Mendocino Bay. A picturesque path that runs atop the southern bluffs (if you walk EAST), will take you to the wooden staircase that leads down to this sandy beach. Drive South out of Village and take first left before bridge to drive to sand. Perfect for exploring and hiking, this park features 1,162 acres with 7,630 feet of ocean frontage, with rugged headlands, beaches, tide pools and the Devil's Punch Bowl sea cave on one side and on the other side you'll find the heavily forested Russian Gulch Creek Canyon and the 36-foot high waterfall. On leash at all times. The long shallow beach is perfect for kids and dogs are OK, but must be on a leash at all times.! Dive for abalone, fish to your heart's content or hit the water for a little surfing, boogie-boarding, kayaking, snorkeling or swimming. Sunbathe on our sandy shores, or comb the Beach for shells. Dogs are OK, but must be on a leash at all times. Popular with hikers, joggers, equestrians and bicyclists. This park is best known for all the seals that live in this beautiful and varied habitat of sandy beaches, ocean bluffs, sand dunes and tide pools to forests and wetlands.